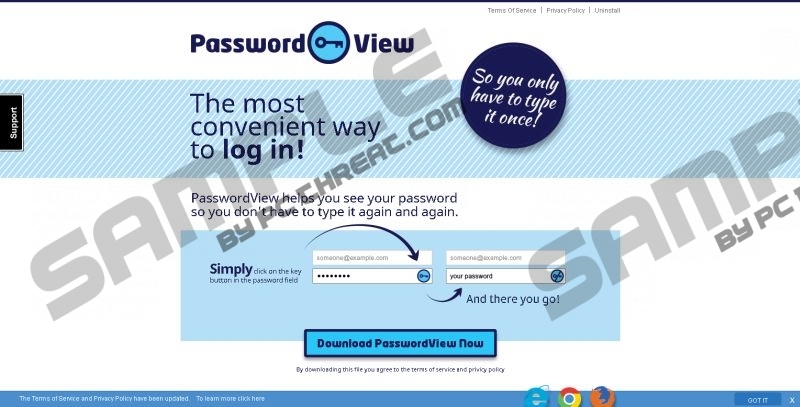 PasswordView is an intrusive adware program that any security-minded person should remove without any hesitation. The application says it remembers your online passwords, and you will not need to enter them again. We will not discuss whether this feature is beneficial or not. What we want to say is that keeping the adware application on your computer could expose your system to online threats. Advertisements generated by this program are filled with redirect links, and you may find yourself transferred to unknown and potentially dangerous websites. Delete PasswordView from your system and forget about it for good. You should not trust this program also because it probably has already tricked you before. The most likely way how this adware application enters the system is by coming in software bundles. Users receive PasswordView when they download and install free programs they find on file sharing websites. In most cases, it is possible to decline PasswordView and similar adware programs, but you will need to go for the Advanced installation mode to do this. You need to be very attentive when you install any freeware because developers of malicious applications also tend to put them into packages with legitimate programs. Next time you may receive not an adware program, but a dangerous virus that could cause much damage to your PC. PasswordView comes from the infamous Lyrics family. It is quite similar to Ayoora, Search Armor, and many other adware programs. All of them irritate users with commercial ads. You will encounter advertisements each time you launch your Internet browser. Please be aware of possible dangers those ads may contain. With just a single click on any advertisement generated by PasswordView, you can be redirected to suspicious and unreliable websites. Maybe the adware application just serves as a promotion tool for the owners of those sites to increase the web traffic for them. However, the third parties that are responsible for those websites could have various illicit goals in their mind. They could try to steal your personal information in order to launch a financial attack on you. You can even be tricked into entering your credentials on some fake gaming website. The best you can do is to prevent any dreadful consequences by removing PasswordView from your computer. Elimination of PasswordView should be your utmost priority. Even if this program is capable of functioning accordingly to its promises, benefits of its usage are highly questionable. You should not trust your passwords to suspicious applications. We have prepared a short guide that should assist you in removal of this adware program. After you are done with this application, consider scanning your device for the presence of additional unwanted programs. You will surely increase the level of your online security by using a trustworthy antimalware scanner. Please contact us via Twitter, Google+, and Facebook in case you have any questions related to the elimination of this program. Of course, you can also post your questions using a comment box you will find below. Open Add or Remove Programs and eliminate PasswordView. Quick & tested solution for PasswordView removal.